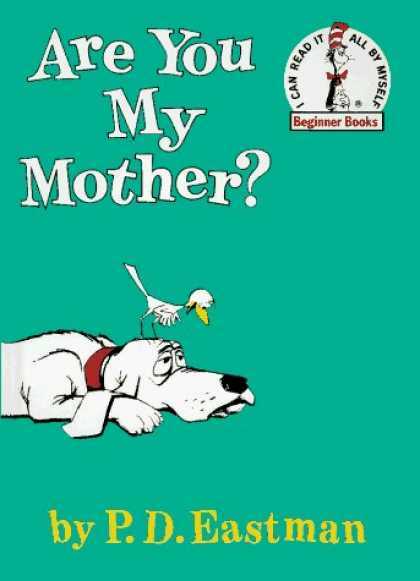 A favorite of mine from first grade (1966) and now being read by my first grade daughter, this classic by P.D. Eastman tells the story of a bird who hatches when its mother is away, and of the search for its mother. The bird queries several animals and machines before being reunited with and introduced to its mother in the end. It’s a whimsical story of a baby’s innocence, silly really. As I child I knew that one could only have one mommy. As I grew and learned of adoption, divorce, widowhood and remarriage, I learned that one could have more than one mother, step or otherwise, in sequence. Still, the thought that a child could not know its own mother, or have more than one are the impossibilities that drive the trajectory of the story line. Who knew that those impossibilities would become commonalities. Today’s New York Post tells the story of a woman who was mistakenly implanted with another couple’s embryo at an IVF clinic. Read the story here. Certainly the origins of the zygote are a compelling case. But the baby becomes literally the flesh and blood of the woman in whose womb it grew. Its rhythms in sync with hers. It’s collective consciousness at birth all shaped by the in utero experience. What is natural and soothing is the sound of the birth mother’s voice, heartbeat, etc. I honestly do not know who the mother is here. I tend toward the one in whom the baby grew, as that is the only ‘natural’ dimension of procreation in the whole sick and twisted process of bringing the child into the world through artificial means. At least in the less complicated world of my childhood, there was a simple, natural, and happy ending to the book. What a terrible waste that this rupture consumes so much time and energy from the scientific and medical communities, when our time and talents could be and should be used for advancing humanity, rather than inventing new nomenclature and new laws for a new hybrid race of humans. To begin with an openness to life and the Love that comes with that, and the continued openness to Love and giving back of that Love. Well, if it’s a question of a biological nature – genetics and blood relation would only be inherited from a woman’s egg. The egg contains half of the chromosomes necessary to create life, which carries all genetic material. So whichever woman the embryo came from – that is the real biological mother – regardless of which ‘womb’ in grew inside of. The child will only inherit biological traits from this woman (plus from the biological father). Therefore, the mother who carried the child does not and will never become the ‘flesh and blood’ relation of the child she carried. I’m not sure how or where you came to that conclusion. That’s biologically inaccurate. However, she is in essence a ‘birth mother’ because she carried and gave birth to the child but beyond that there is no further biological relationship. That’s why these types of procedures are messy. Alot of room for procedural error as such a case demonstrates. However, while I feel bad for the woman who gave birth, I do feel legal rights pertaining to motherhood should remain with the natural mother who is responsible for making the child. Without her egg and the father’s sperm, there never would have been a child to give birth to. The only difference now for the genetic mother is that she is now placed in a similar position as a biological father who doesn’t give birth to their own children. But she shouldn’t be penalized or forced to give away a child she never volunteered to give away to another woman in the first place. The birth ‘mom’ has been wronged too but not by the biological mother. Sorry if that’s an unpopular opinion (don’t know if it really is) but that’s how I see it. The implanted zygote certainly carries the blueprint. However, at birth, every molecule, every atom of that baby’s body have come to it through the woman who carried it. She literally ate and digested the food that it consumed in growth. Breathed in the oxygen it would use, and exhaled all of the carbon dioxide it produced. She excreted its nitrogenous wastes, and gave it all of its antibodies as a primitive immune system. My colleague at HeadlineBistro, Vicki Thorn, has written an article and links to scientific evidence that mother and child exchange cells that last in each other for up to 40 decades and may assist in healing. So actually, biologically, at birth the baby is composed entirely of the gestational mother’s very substance, even harboring her cells. on May 24, 2010 at 3:58 AM L.
Certainly not biology, as loving adoptive families show. Sometimes biological ties do matter, but sometimes they are completely irrelevant. The commitment to love and raise a child defines parenthood.